I'm in my hospital now at 3 o'clock in the morning. I became very drowsy last night, earlier than usual, and hit the hay. I was going to sleep deeply until the morning, but I was troubled with nightmares. A serious patient showed up in my dream, saying "Do something! Remove my pain!" He is the patient who I was worring about. I have just done some treatment now. Mr.Shinzo Abe became the prime minister of Japan today. I expect him to follow an aggressive diplomacy. Japanese leaders have been taking an ostrich policy against China and Korea. Consequently it came back to haunt us. Japan should speak up for what we are going to advocate. I think that the new prime minister can do the talking to particular kind of asian countries; China and Both Korea. I've received several e-mails from those countries. Many of them are critical of my opinion in this blog. It seems that they don't have enough information or are confined in those countries. I'd like to express my opinion here. Today is burnable trash day! There is a spreading move to charge for plastic shopping bags in Japan. Checkout bags are delivered at supermarkets or convenience stores. It's very convenient but could be the cause of a pile of pollution. This movement is to try to reduce the amount of trash. For example, in 2002, Suginami Ward, Tokyo, set an ordinance to impose a 5 yen tax on each plastic shopping bag. I heard that 30 billion sheets of checkout bags are used in a year. The current legislation relating to checkout bags demands the collection of the bags which are thrown away from households as recyclable garbage. Unfortunately,in reality, few municipalities collect them as recyclable trash. Most of the checkout bags are buried in disposal facilities or incinerated. In my hometown, Matsuyama city, authorities are also extremely demanding that garbage is separated according to type. Consequently, my wife shouts everyday like at the front. My eldest daughter is enrolled at a university in Tokyo. Though she was on her summer vacation during August and September, she didn't come back until September. I'm always thinking of her, wanting to see her. As the proverb says, "No child knows how dear she is to her parents." After her return home, she took an offical written test for her driver's license, and she passed it in one try. As soon as she got her driver's license, she wanted to go to Tokyo. (I don't want to say "go back to Tokyo".) I imagine that student life in Tokyo would be happy, but I miss eating dinner with all of my family. Today I have been to Niihama city, about a one hour's drive away from here. I joined the talk show of a Korean movie star, Mr. Lee Kyung Won （李京源）. It's the first time for me to attend such a meeting. He performed as a supporting actor in the historical TV drama, "Daejanggum （大長今）," with Korean dishes and a medical theme. He told us untold stories behind the drama. It was interesting. To my utter surprise, he spoke to us in fluent Japanese. I was impressed that the acquisition of another language enriches life culturally and spiritually. I'd made up my mind again to learn Korean, German, and English. And if I can, I'd like to learn French, Spanish, and Swahili. It must be wonderful to communicate with those languages. After my early retirement, I really want to enjoy wandering all over the world. I was relieved that the big typhoon has passed away from my hometown. Every summer and autumn, a serious typhoon hits Japan. Generally speaking, typhoons are smaller than hurricanes, but they often damage Japan every year. A big typhoon was on its way to Japan. This typhoon was much bigger than usual and I was worried. It was lucky that the typhoon veered away. Japan is stronger against natural disasters than Specific Asia (means both China and Korea), but a few typhoons level a certain area every year. A Korean movie star is coming to Niihama city in Ehime prefecture tomorrow. I'm planning to see him. I'm afraid that his flight from Korea might be cancelled. It was really lucky the typhoon veered off. The road veers to the left just outside of town. 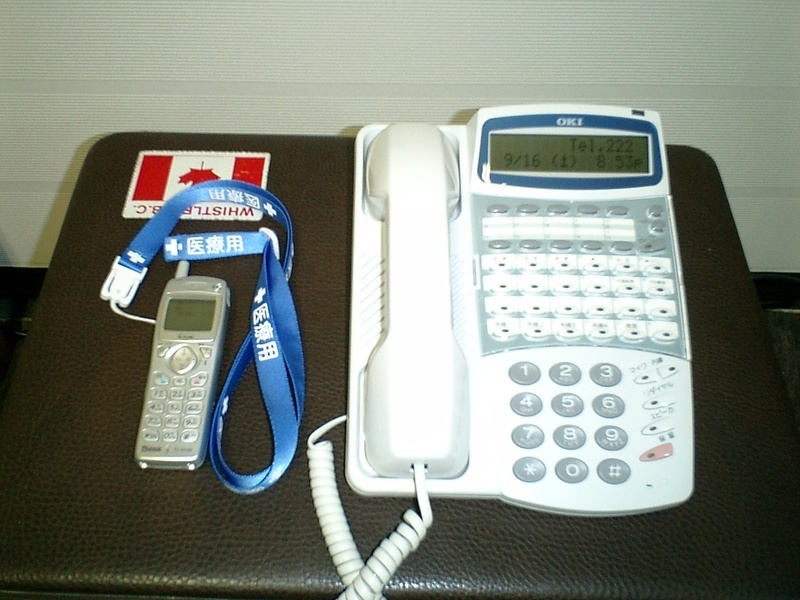 Today, the total replacement of telephones was done in my hospital. Besides, doctors, head nurses, and some representatives of each section have got to have PHS all the time. It's a thorny issue for me. When I was tired, or wanted to take a nap for a while, I made it a rule to stay at some places except in my private room in my hospital. To tell the truth, I hid everywhere in my hospital. Sometimes the X-ray room, sometimes the rehabilitation room, sometimes the cafeteria. If I am in my room, I'll be surely caught by the phone. It's why I stay in other places. Though my co-workers may search for me, I can get some relaxation for some time. However, such relaxation time has become kind of a dream from now on. I'm writing up the memo bit by bit that I dashed off during my touring. When I checked some websites to know how to use a few words in real sentences, I found uncomfortable pictures on a website. If you are Japanese, Google "桂陽中学校". You'll find many websites or blogs that criticize Korea only in Japanese. I think those are nonsense because Korean people can't understand it. A Canadian blog shows many anti-Japanese pictures that were drawn by junior high school students. To my surprise, those pictures were displayed in an official exhibition in a subway station in Incheon(仁川). You know, this exhibition should have been one of school activities. A Canadian was aghast at the fact that the Korean Government is formally fermenting anti-Japanese ideas. Liancourt Rocks (Takeshima) is Japanese territory and the Korean allegation has no grounds because they don't have any grounds. They squat on Takeshima and avoid talking at the International Court of Justice. I've been wondering why Korean people don't learn their own history. I knew why today. They are under Government mind control. I've some acquaintances in Korea and I like Korean cuisine and culture. However, I don't agree with the politics of the Korean Government. I tried to stop giving steroids. Just after that, severe constipation occurred. Besides, the high fever started. Consequently I restarted giving steroids and was unable to stop giving them. At the 2nd operation I removed the shunt tube and the symptom of hydrocephalia seemed to appear. What a pickle we are in! I'm learning Korean since 2 years ago. However, I had no chance to visit South Korea and actually use Korean. I wanted to post some messages to Korean Websites, but I didn't have enough courage. The patient had a bowel movement. This means that the patient is getting better. It's lucky and happy. This feeling couldn't be felt except by doctors I guess. No one can imagine that anothers' defecation is the delight of general surgeons.